At present, a mission to survey the ocean floor with an Autonomous Underwater Vehicle (AUV) is typically planned by selecting a list of waypoints that then the vehicle will automatically navigate through while keeping a safe distance from the bottom. 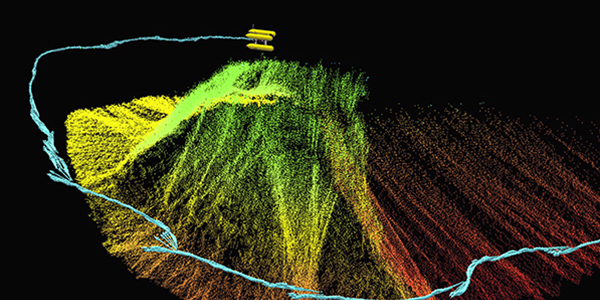 Nonetheless, this approach has major drawbacks: (1) it does not allow the vehicle to safely operate amidst protrusions on the sea floor; (2) when traversing rugged terrain, the vehicle is forced to keep a conservative altitude, limiting applications requiring close proximity such as photomosaicing; (3) when inspecting 3D, protruding structures from the bottom the vehicle can only perceive them from an overhead viewpoint, resulting in poor data collected from these sites; (4) it does not account for the effect of the terrain on the vehicle’s position estimates. To address these limitations, this thesis proposes new methods to find collision-free paths allowing an AUV to cover an area of the ocean floor with its sensors, which is known as coverage path planning. First, we propose a coverage path planning method to plan 2D, safe-altitude surveys which provides a principled way to account for obstacles in AUV survey planning. Its main advantage is that it minimizes redundant coverage when the vehicle navigates at constant depth, leading to shorter paths. Second, we provide a method to account for the uncertainty in the vehicle position estimates when planning 2D surveys. The method minimizes the uncertainty induced by the path and leads to better maps of the ocean floor as a result. Third, we provide a coverage path planning method suitable for inspecting areas of the ocean floor including 3D structures. The resulting coverage paths enable applications requiring close proximity and allow viewpoints for full 3D sensing of the structure. Moreover, by contrast to most existing methods, we provide two techniques to adapt the planned path in realtime using sensor information acquired on-line during the mission, rather than only planning the path off-line and relying on the unrealistic assumption of an idealized path execution by the AUV. The proposed methods are validated in simulation and in experiments with a real-world AUV.